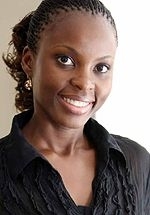 Maureen Namatovu Garrett is a Ugandan fashion designer who was a contestant on the second season of the reality competition Big Brother Africa, in 2007. She was born in Entebbe. Describing herself as playful, naughty and silly sometimes, Maureen says that going to India to study changed her life. She says that graduating from college in the India was her best achievement because "the culture is so different from mine." A fashion designer by trade, she’s coined the term ‘glamassic’ to explain her clothing style which is glamourous and classic. Maureen relaxes by doing yoga, would love to visit New York and watches Formula One racing. She loves reading biographies and her favourite book is the biography A Woman Named Jackie. Speaking about her country Maureen says Ugandans are very welcoming and that the best place to visit in Uganda is Jinja. Maureen loves music by Shania Twain, Celine Dion and Tina Turner. She also loves the TV programs Survivor, Cheaters, Everybody Loves Raymond and Prison Diaries. She was known as Maureen Namatovu on Big Brother and Garrett to her surname after her marraige in January 2009.